I recently read a discussion about whether or not it is appropriate for children to be doing Valentine’s themed activities. At this time of year we see pink and red hearts everywhere we go. I think it’s nice to use these shapes and colours in what we do. This afternoon I had three children whose age ranged from 2 – 8 years. I gave them each a heart shaped piece of paper and some red, pink and white paint. To save arguments they had a palate of paint of their own. The younger children tend to mix the paint colour, which annoys the older children! I showed them how to paint on one side of the paper then fold it over to create a symmetrical pattern. This brought back memories for me of being at Primary school, I remember doing it as a child. lt was such a simple activity yet all the children enjoyed it at their own level. 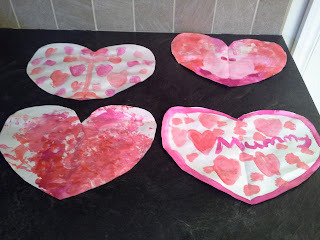 The four year old had a go at using the folded paper and scissors to cut a heart out. The youngest child chose to do some handprint painting while the eldest created pictures for her Mum and Dad. Later in the week we are going to do some Valentines baking. I have the heart shaped silicone cake mould that I bought last year and some heart shaped sprinkles.